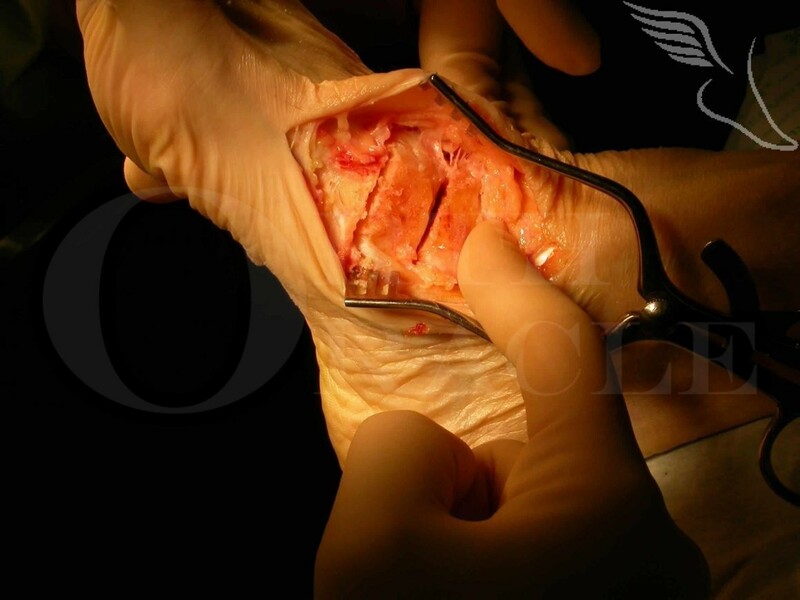 Learn the Wedge Tarsectomy & dorsi-flexing Lapidus surgical technique with step by step instructions on OrthOracle. Our e-learning platform contains high resolution images and a certified CME of the Wedge Tarsectomy & dorsi-flexing Lapidus surgical procedure. There are various disparate causes of a Cavo-varus foot deformity all of which result in varying degrees of characteristic deformity secondary to imbalanced muscular action. The objective of all treatment , operative and non-operative, is to place (and hold) a balanced foot squarely beneath the Tibia. Surgical management in particular is often referred to as “A La Carte” , alluding to the very specific nature of individual interventions for individual components of the deformity. The indication for a Wedge tarsectomy is for correction of a comprehensive midfoot cavus. It is also possible to correct an element of adductus by excising an asymmetric tarsal wedge. If the excised tarsal wedge is truncated in its plantar aspect (in other words a wide based rather than sharp apex is cut) then secondary tightening of the plantar fascia is less likely to occur on closure of the wedge.